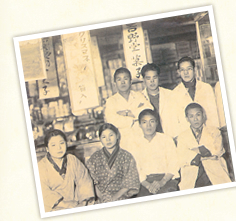 In 1912, Hiyoko was born from the passion of Shigeru Ishizaka, then a store manager. He felt that sweets are like living things and that taste has infinite possibilities. He also felt that our products symbolize not only our lives but also our true hearts. Our feelings have remained the same, ever since Hiyoko began. We pledge to honor, preserve and protect those sentiments well into the future. Our sentiments have remained constant since the time Hiyoko was born. The delicious taste has been adored everywhere and is the source of our passion about what we do. The birthplace of Hiyoko is Chikuho Iizuka. Hiyoko debuted in 1912 in this town famous for sweets. Iizuka was a mining town, and all the miners who worked away in the mines had a taste for sweets, which helped them to maintain their energy. In addition, as the mines often dealt with people from places like Osaka and Tokyo, Hiyoko became a popular item for visitors to take back to their friends and families. A second generation store manager of a sweets store that was operating since the Meiji era, Shigeru Ishizaka was always up for a challenge. He sought to make something that would be loved by all. As the story goes, when sleeping one night, he beheld Hiyoko as it would come to be in a dream. The popularity of chicken farming at the time undoubtedly influenced his vision. shape made it an instant hit. When the third generation store manager Hirokazu Ishizaka was at the helm, a new store opened in Fukuoka in 1957, which happened to be the year of the rooster. 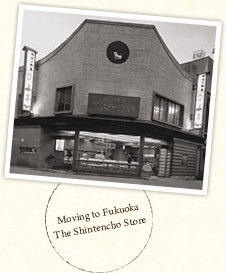 The store was built on prime real estate in the Shintencho area, present-day Tenjin 2-Chome. Hiyoko also became loved in Hakata and was soon famous far and wide as a Kyushu treat. Then, in 1964, with a dream of making Hiyoko the top national sweet, Hirokazu focused on Tokyo when the Olympic Games were held there. This is how Hiyoko came to Tokyo. The first store opened in the Yaesu Underground Shopping District at Tokyo Station in 1966, the year when the Tohoku Shinkansen (bullet train) line opened, and soon Hiyoko became widely loved as a Tokyo souvenir as well. 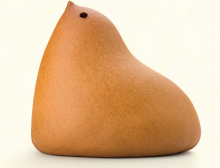 The adorably shaped Hiyoko treat with its bean jam filled “yolk”, which originated in Chikuho Iizuka, expanded to Fukuoka and then to Tokyo and beyond, becoming a treat loved and enjoyed nationwide. 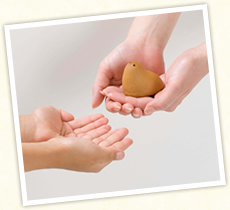 We hope to carry on the passion that began this journey and have Hiyoko remain a treat enjoyed universally. In due time, we hope to bring people together for happy and wonderful times all over the world. 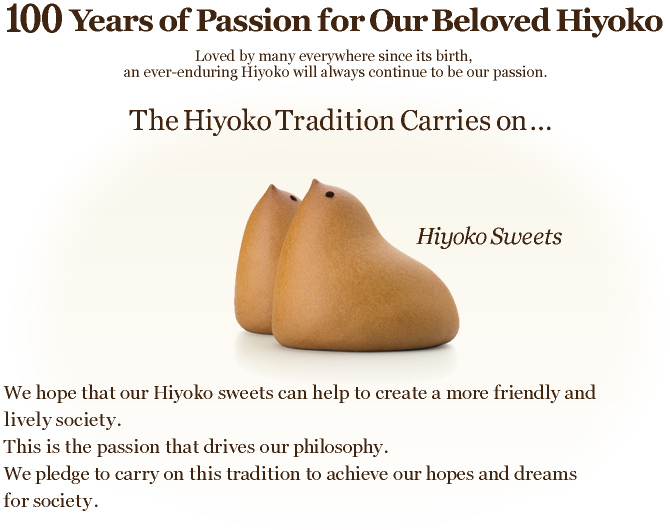 Driven by our passion, Hiyoko will surely become a sweet and popular global presence.